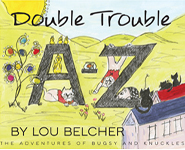 Before You Write – Lou Belcher | On this blog, thoughts on writing, art and whimsy by Lou Belcher. Here’s my latest painting. This one is 8″ x 8″ x 1.5″ mixed media (acrylic, charcoal, paint sticks) on gallery-wrapped canvas. Just an experiment with the yellow background. I do enjoy flowers… And, I know all you in the north are looking forward to when the flowers are blooming up there again. Yes, we are participating in the Sunday Selfie Blog Hop put on by The Cat on My Head blog. We hope you all have a wonderful day! Us? We’re getting our easy on! Not a joke. More times than any artist cares to admit, paintings just don’t work out. I used to fret over the failures and try to fix them. I painted the painting above a couple days ago. It was a group of flowers. Somewhere along the way, it took an ugly turn. Today, I attempted to bring it to life. That didn’t work. When I heard the canvas groaning in disgust, I got out the gesso and painted over it. That’s how it works. Tomorrow a fresh start right over the flowers. No sweat. It’s all just part of the process. We’ve missed the Sunday Selfie Blog Hop put on by The Cat On My Head blog for a while. Today we are participating. Hugs, Bugsy, Knuckles, and Lou. I just retired from the last of the boards that I’ve been on and I feel liberated. I’m not one who enjoys confrontation, so it is such a relief. to be free of it, to wake up today and not have to worry about walking on eggshells. Yes. It feels good. On to other pursuits. The boys are doing well and send their best. Have a great day. Just wanted to touch base. It’s Friday. Do something super on the weekend. This piece is the large floral (24″ x 30″) painting. On gallery-wrapped canvas that I completed in the fall workshop I did with Lynn Whipple. The workshop was wonderful. I have a couple more paintings from that 3-day workshop that need some tweaking. I’ll be getting to those soon and will show them to you as I finish them. I have set some intentions for 2019, but they are general… 1. Write daily 2. Paint daily 3. Eat less 4. Move more. In the past I’ve done detailed lists of resolutions. This year I decided to go simple… So far it’s working fine. In the writing area, I’m contemplating a memoir. Not because my life is so exciting. Rather, because I’ve learned so things the hard way it may be useful for others to know the lessons I’ve learned. After all, people seemed to like the lessons in Max the Quilt Cat’s book. 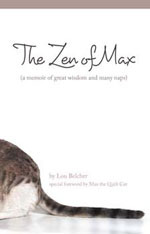 The Zen of Max. Ha! Bugsy and Knuckles are doing great and are wishing all of you a great weekend. Here’s Knuckles keeping warm by basking in the light of the lamp. I think he thinks it’s a sun lamp… His favorite spot! I posted this on The Helpful Blogger yesterday. Thought you might like to see it. You could make a vegan very thankful on Thanksgiving with this dish or make it as a show-stopping side dish. Anyway… we wish you a Happy Thanksgiving. At the same time, a photographer from one of the local magazines stopped by and started taking photos. The photographer encouraged me to continue to work on the drawing-she wanted an action shot. Yuck! At that pointed, I ended the photo shoot and asked the photographer to delete the photos. Glad that I’m healthy, but aging is a bit of a pain… When I get up the nerve, I’m going to take a selfie to see how bad it is. For now, (LOL) ignorance is bliss.